Title: 05/01/1986 - Applicability of the Hazard Communication standard to pesticides. This is in response to your letters of October 3, 1985, and April 10 regarding the Hazard Communication Standard (HCS). Please excuse our delay in responding and any inconvenience it may have caused. A manufacturing plant uses and stores several hazardous substances. Oil tanks and reactor vessels are provided with signs showing the chemical name, i.e., sulfuric acid, and a code name. Every employee is trained to recognize what the code name means and he/she can find out details on hazardous aspects of the substance by checking the codebook in the plant office. The codebook contains, among other guidelines, the material safety data sheet (MSDS) for the coded material. QUESTION: Does this system satisfy labeling requirements of the Occupational Safety and Health Administration (OSHA) Hazard Communication Standard? ANSWER: The methods described in your question appear to fit into the category of labeling alternatives found under paragraph (f)(5) of 29 CFR 1910.1200. As such they will meet the intent of the standard as long as the use of this method is restricted to stationary process containers. A manufacturing plant identifies a sulfuric acid tank with a label: DANGER: - SULFURIC ACID. Next to it is the Department of Transportation (DOT) label for corrosive substances showing the picture of a liquid spill on a hand. QUESTION: Does this composite label meet the OSHA requirements? 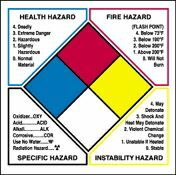 ANSWER: For in-plant labels the standard identifies two requirements: chemical identity and appropriate hazard warnings (29 CFR 1910.1200 (f)(4)(i) and (f)(4)(ii)). The "SULFURIC ACID" wording would satisfy the identity requirements as long as the same term was utilized for cross-referencing purposes on the material safety data sheets and required list of hazardous chemicals. The requirement for "appropriate hazard warning" will only be met in all significant health and physical effects appear on the label. The labeling alternative referenced in our response to your first question should be consulted for further guidance. A company owns and operates a pesticide warehouse. All of the pesticide products are received in containers and sold as such to dealers and/or farmers. There is a remote chance of a spill from time to time requiring cleanup of materials. QUESTION: Are material safety data sheets required to be on site for all of the products? What type of training, if any, is required under the OSHA standards? ANSWER: From your question it would appear that the facility concerned is not currently one of the industries covered by the scope of the standard (Standard Industrial Classification (SIC) Codes 20-39) [ILPI Says: Caution: see this note below]. It is recommended that material safety data sheets be made available because of the predictable exposure you have referenced. A company has a fertilizer and pesticide location. Bulk pesticide facilities, as well as smaller containers are at the location. Fifty percent of the products are custom applied by company personnel as a fertilizer/pesticide material to the farmer's field. Twenty-five percent of the products are sold directly to the farmer for his own application. Twenty-five percent of the products are sold to dealers who either sell directly to the farmer or custom-apply the products for the farmer. QUESTION: Are material safety data sheets required to be on site for all the products? What type of training, if any, is required for the company personnel under OSHA standards? ANSWER: If the location has been classified in SIC codes 20 through 39 then it would be within the scope of the HCS [ILPI Says: Caution: see this note below]. The employer would be required to maintain copies of the material safety data sheets for each hazardous chemical in the workplace as well as providing training and meeting all of the requirements of the HCS that apply to a chemical manufacturer. Establishments blending and formulating fertilizers and pesticides are normally classified in SIC Codes 2875 or 2879 [ILPI Says: Caution: see this note below]. Employers involved in the application of pesticides fall under standards established by the U.S. Environmental Protection Agency (EPA). When a manufacturer of a product ships to a business he is required to furnish a material safety data sheet to the distributors. A given distributor has many individual outlets. QUESTION: What is the manufacturer's responsibility in the supplying of material safety data sheets to these outlets? ANSWER: If the manufacturer is selling to the distributor and not the outlets, then the manufacturer is only required to provide material safety data sheets to the distributor. It is the distributor's responsibility to furnish material safety data sheets to other distributors and employers in SIC codes 20-39 [ILPI Says: Caution: see this note below]. A company owns and operates a pesticide warehouse and a number of retail outlets. Most of the pesticides are purchased and resold in containers, some are purchased in bulk and resold in minibulk tanks, and some are impregnated on dry fertilizer material for application on the farm or mixed with nitrogen solution for direct application. QUESTION: To whom should material safety data sheets be available or disseminated and what type of training is required? ANSWER: The term pesticide warehouse at first glance appears to present an establishment that does not fall within the scope of SIC codes covered by the HCS [ILPI Says: Caution: see this note below]. Your question however, indicates that some blending and repackaging is customary. These operations are included in those that are used to define a chemical manufacturer with respect to the HCS applicability; reference the definitions for "chemical manufacturer" and "produce" under paragraph (c) of 29 CFR 1910.1200. As a chemical manufacturer the establishment would have to meet the standard in-house requirements for a written program, labeling, material safety data sheets and training. A company operates a number of fertilizer and pesticide retail locations which sell directly to farmers. None of these retail locations are categorized in SIC codes 20-39 [ILPI Says: Caution: see this note below]. QUESTIONS: Are material safety data sheets, training, and a written program required for any of these locations? ANSWER: No, These locations would not be included in the scope of the standard. A company operates "crossroads" dry or liquid fertilizer blending facilities. Pesticides sometimes are mixed or blended into the fertilizers at the site for custom or farmer applications. The facility has an EPA "establishment number". Note: This question is a variant of Question 6. QUESTION: Is such a facility considered to be a "manufacturing facility?" If yes, which of the following would it be required to comply with: training plan, material safety data sheet on file, material safety data sheet delivery to the purchaser? Would the Federal Insecticide, Fungicide, and Rodenticide Act (FIFRA) exemption apply? If not, why not? ANSWER: Please refer back to our answer to question number 6 As a manufacturer of pesticides you are still required to comply with the HCS requirements, except those specific labeling exemptions referenced under 29 CFR 1910.1200 (b). Would DOT placarding, if used, cover applications vehicles as to Hazard Communications? ANSWER: OSHA has no jurisdiction over application. A company operates a pesticide formulation facility which provides custom formulation services for pesticide products sold under others' labels. We believe the facility would meet the criteria to be classified as a manufacturing facility. QUESTION: Would it be required to meet the full range of hazard communication standards? To whom would it provide material safety data sheets? From whom should it obtain them? ANSWER: If the establishment is classified in SIC codes 20 through 39 then all applicable provisions of the HCS would apply [ILPI Says: Caution: see this note below]. The chemical manufacturing, importer or distributor should supply the material safety data sheet for the hazardous chemicals purchased from these sources. The formulating facility would provide material safety data sheets to distributors and other chemical manufacturers. A Pesticide distributor infrequently sells an "end-use product" to a formulator who will use it in the formulation of another product. QUESTION: Does this sale of an "end use" vs. a "manufacturing use" product to a formulator subject the distributor to OSHA Hazard Communication rules? To all? If not, to which requirements? ANSWER: The SIC code of the formulator is the determining factor [ILPI Says: Caution: see this note below]. The distributor would be required to provide material safety data sheets to formulators classified in SIC codes 20 through 39 [ILPI Says: Caution: see this note below]. The answers above that relate to the standard's application by SIC code must be modified in States where a more expansive standard has been enacted. ILPI Says: the SIC code requirements were changed. The entire manufacturing and construction industry is covered by the current standard. We hope that we have adequately addressed your inquiry and you are able to apply our responses to the summary paragraph of your questions. Again, we apologize for the delay in this response and any inconvenience you may have experienced. If we can be of further assistance, please do not hesitate to contact us. On October 3, 1986 after conversation with Jennifer Silk we wrote to Mr. John B. Miles requesting written interpretations to clarify certain ambiguities - at least to us - in OSHA's Hazardous Communication regulations. To date we have not received even an acknowledgment, much less a reply. The Southern Agricultural Chemicals association (SACA) is an independent, regional trade association composed of formulators, distributors, basic manufacturers of agricultural pesticides, & suppliers of products and services to the industry. The Association's membership represents over 90 percent of those companies in the aforementioned categories which operate in thirteen southern states extending from Delaware-Maryland across the South to include Louisiana & Arkansas across the Mississippi. SACA supports strongly the intent of the rules and only wishes to assist its members in complying with them. With assistance from OSHA in clarifying the rules to the maximum extent possible we can help to make our workplaces more safe for workers and others. Please assist us in assuring appropriate actions to produce a response to the questions posed in our letter. I am writing to pose several questions to your compliance with OSHA's Hazard Communication Standard. Jennifer Silk suggested your office would be best qualified to answer our questions. Most pertain to the requirement to provide MSDS's to certain users who deal with agricultural pesticides and fertilizers. Our people have attended various workshops and have access to your Instruction CPL 2-2.38 and MSDS Contents Summary. The attached questions/situations pertain to some of our members & are not clearly covered in the rules clarifications issued thus far. We would very much appreciate your office looking into the situations posed and giving us written guidance & interpretation so that we may publish it to our members, thus better assuring compliance with the rules. A manufacturing plant uses and stores several hazardous substances. Oil tanks and reactor vessels are provided with signs showing the chemical name, i.e., sulfuric acid, and a code name. Every employee is trained to recognize what the code name means and he/she can find out details on hazardous aspects of the substance by checking the codebook in the plant office. The codebook contains, among guidelines, the MSDS for the coded material. QUESTIONS: Does this system satisfy labeling requirements of the OSHA Communication Standards? A manufacturing plant identifies a sulfuric acid tank with a label: DANGER - SULFURIC ACID. Next to it is the DOT label for corrosive substances showing the picture of a liquid spill on hand. A company owns and operates a pesticide warehouse. All of the pesticide products are received in containers and sold as such to dealers and/or farmers. There is a remote chance of a spill from time to time requiring clean-up of materials. QUESTION: Are MSDSs required to be on site for all of the products? What type of training, if any, is required under the OSHA standards? A company has a fertilizer and pesticide location. 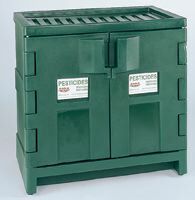 Bulk pesticide facilities, as well as smaller containers are at the location. 50% of the products are custom applied by company personnel as a fertilizer/pesticide material to the farmer's field. 25% of the products are sold directly to the farmer for his own application. 25% of the products are sold to dealers who either sells directly to the farmer or custom applies the products for the farmer. QUESTION: Are MSDSs required to be on site for all the products? What type of training, if any, is required for the company personnel under OSHA standards? When a manufacturer of product ships to a business he is required to furnish a MSDS to the distributor. A given distributor has many individual outlets. A company owns and operates a pesticide warehouse and a number of retail outlets. Most of the pesticides are purchased and resold in containers, some are purchased in bulk and resold in minibulk tanks, and some are impregnated on dry fertilizer material for application on the farm or mixed with nitro solution for direct application. QUESTION: To whom should MSDSs be available or disseminated and what type of training is required? A company operates a number of fertilizer and pesticide retail locations which sell directly to farmers. None of these retail locations are categorized in SIC Codes 20 - 39. QUESTION: Are MSDSs, training, and a written program required for any of these locations? NOTE: This question is a variant of Question (6). QUESTION: Is such a facility considered to be a "manufacturing facility"? If yes, which of the following would it be required to comply with: training, plan, MSDS on file, MSDS delivery to the purchaser? Would the FIPRA exemption apply? If not, why not? Would DOT placarding if used cover application vehicles? As to Hazard Communication. A company operates a pesticide formulation facility which provides custom formulation services for pesticides products sold under other's labels. We believe the facility would meet the criteria to be classified as a manufacturing facility. QUESTION: Would it be required to meet the full range of hazard communications standards? To whom would it provide MSDSs? From whom should it obtain them? QUESTION: Does this sale of an "end-use" vs a "manufacturing-use" product to a formulator subject the distributor to OSHA Hazard Communication Rules? To all? If not, to which requirements? Please note that if crossroads fertilizer blending plants which may mix some pesticides into the blend are by the act classified as manufacturers, the requirement to obtain the many MSDSs potentially required to be provided to the applicator-user could be virtually impossible to comply with since the original manufacturer of the pesticide is not required to send MSDSs to the distributor who in turn would have to provide them to the blending facility. We believe this to be beyond the original intent of the rule, but are afraid of possible too technical interpretations.